You'll be £12.99 closer to your next £10.00 credit when you purchase Remember the 70s. What's this? Order within the next 3 hours, 7 minutes to get your order processed the next working day! When you think about the 1970s, what comes to mind? Flares? Queen? Rocky? The 1970s was one of the most exciting, innovative and colourful decades of recent history. With major events in music, film and television, the introduction of new technology, and the rising tide of socio-political change, the decade played a key role in British social history. This decade saw many memorable occasions: Kenny Dalglish became the most expensive footballer after a £440,000 transfer fee, Freddie Laker launched his budget Skytrain airline, Clive Sinclair launched the two inch television, the late 1970s saw the election of the country's first female prime minister, Margaret Thatcher, and during 1977, the country became enthralled by the Queen's Silver Jubilee - street parties were held up and down the land. Remember the 70s explores this chaotic and pivotal by-gone era, and by doing so, the author uncovers hidden truths, gives insight into the dazzling array of inventions and the presence of popular culture, as well as remarking upon how these events, and how the decade as a whole, resonated until this very day. Remember the 70’s? I certainly do. 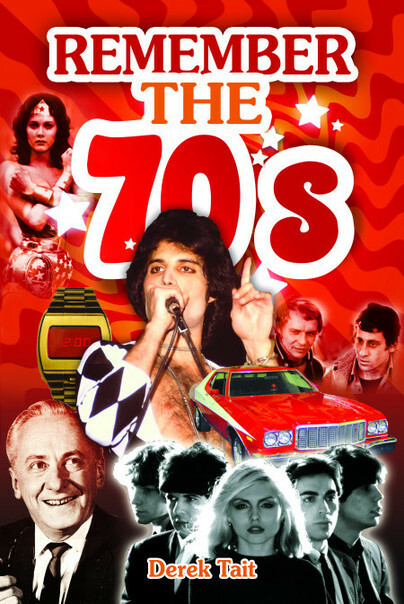 I won’t go as far as to say my age, but I was born in the 70’s (and more towards the beginning than the end!). So I can safely say, I do remember most of the 70’s! On looking, the author has written some great other books on subjects of bygone years which I’ll be looking at to read at a later date! A good nostalgic read, as a child of the seventies I can just about remember especially the glam rock groups and the flares, cheesecloth etc. There's lots of nostalgic fun in this broad view of the decade. A fab, fact filled book, which is written in an engaging style. Loosely divided into categories such as politics, news, sport, film, music etc. a fascinating series of memory joggers of that time. As it was the time of my youth it brought back so many memories and got me thinking of my own - family, friends and the days. From that point of view, hugely enjoyable. I like books like this, so was pleased when the Publisher granted my wish and gave me a copy of the book. Also, on looking, the author has written some great other books on subjects of bygone years which I’ll be looking at to read at a later date! Derek Tait is a full-time author who lives in Plymouth. Born in 1961, he lived his early years in Singapore and Malaysia and has written several books about his time there, including 'Sampans, Banyans and Rambutans'. A former photographer and cartoonist, his work has been featured in newspapers and magazines around the world. A keen historian, his books include '1950s Childhood,' 'A 1970s Childhood,' 'Butlins An Illustrated History' and 'Houdini the British Tours' as well as many books in the 'Through Time' series for Amberley Publishing.He has also written many local history books including 'Plymouth,' 'Plymouth at War,' 'Saltash Passage,' 'St Budeaux,' 'Plymouth Hoe,' 'Mount Edgcumbe,' 'Saltash,' 'Memories of St Budeaux,' 'Plymouth Tales From the Past' and 'Images of Plymouth.